Do you want to know more about the Canon 24-105 lens? 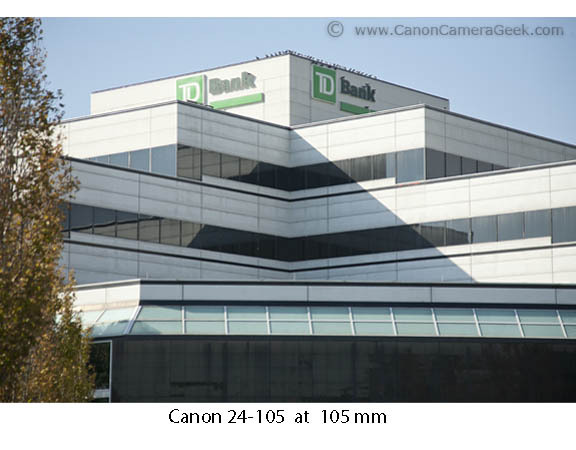 At first glance you might think that the 24-105 would be an obvious choice over the Canon 24-70. After all, why wouldn't you the longer zoom range and less weight when you look at these two professional mid-range zoom lenses made by Canon. 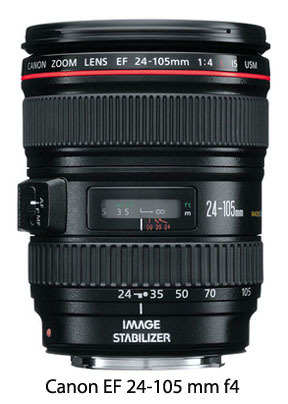 The Canon EF 24-105mm f4 IS can easily be considered the best Canon camera lens to have. Its zoom range goes from a real nice wide angle to a medium telephoto with an easy twist of the wrist. Although f4 is by no mean considered real "fast," with today's high ISO sensors you still can shoot without flash in many low-light situations. This is the lens that stays on my camera year round, except when I am heading out to do a senior portrait session when I rely on my Canon 70-200 f2.8. 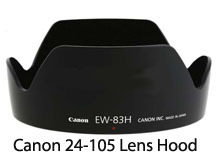 The Canon 24-105 lens is part of the Canon "L" series that comes with the traditional quality design, manufacturing and performance levels. I personally think the lens has a great balanced feel to it as I typically hold my lens in my left hand in between shots during a typical photo shoot. My biggest peeve is the same as other similar zoom lenses. I don't like the petal-shaped lens hoods. I never have. I often shoot portraits with back lighting and the lens hood simply does not prevent sunlight from striking my lens when the angle of the sun is bad. The two solutions to this little annoyance: (1)buy a collapsible hood and (2) rubber band a small black light-blocker to the petal-shaped lens hood. If you want the lens size specifics, it measures 3.3 inches in diameter, is 4.2 inches tall and weighs in at just under 1 1/2 pounds. Here are two photos comparing the view at 105mm and the view at 24mm setting of the same scenery. 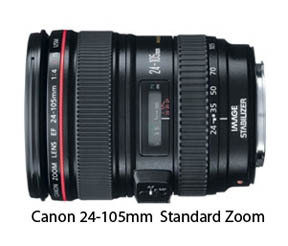 You can see that the Canon EF 24-105mm f/4 L IS USM Len's zoom range is pretty signficant. The photo above is taken at a 105mm lens setting. The photo below is taken at a 24mm lens setting. You can see that there is a bit of vignetting in the upper right corner. Both of these photos were shot at f5. The bottom image includes a black and white inset to show you the coverage from the 105mm lens setting. The 24-105 f4 takes a 77mm filter which matches several of the other Canon camera lens. It is not an inexpensive lens, but if you could have only one lens available to use, this would be the best Canon camera lens to get. If you have to really watch your spending, you might consider the affordable and versatile Canon 28-135 zoom lens as your best Canon camera lens option. If you are looking for something that can go a little wider, try the Canon 17-40 super wide-angle zoom lens. 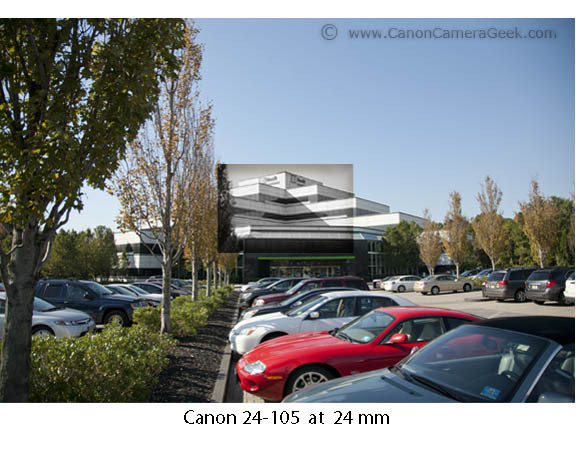 Right-click to download the PDF for the Canon 24-105. This is a well designed and well-made lens. It is attached to my camera more than any of the other Canon lenses I own. It is very sharp and is the perfect weight and balance for the larger Canon DSLR camera bodies like the 5D series that I use. I've never felt like the maximum aperture of f-4 has limited me, although if you really want the ultimate in bokeh, you would want to go with something faster . I've only noticed chromatic aberrations with a wide-open aperture at a wide-angle setting combined with a contrasty situation and I corrected that the appropriate filter in Photoshop. This is a very versatile lens and can be used for many different purposes. Here are several more Canon EF 24-105mm Photos.